When Muses Moved In was completed at the Penland School of Crafts, one winter when I was renting a studio and celebrating a brief moment of zero writer’s block. The story is from the point of view of a narrator who was in a similar position to mine–squirrely with creative energy, but lacking a little focus and motivation. It pokes a little fun at me and a little at the creative process, and how we sometimes wait around for a bolt of inspiration. For me, the lightning bolt comes eventually, but I’d be lying if I said I wasn’t often thinking of ways that I might hurry it along. If some semi-divine creature could appear and help me through the rough parts, I wouldn’t complain. Or at least, I think I wouldn’t. And that kind of thinking is what led to the appearance of these irreverent Muses. Mischievous and unruly, they are not at all what the writer imagined, but they find ways to influence her nonetheless. Included in this motley crew are a Cupid-like figure who hogs the bathtub and a writerly Muse who folds paper airplanes out of manuscripts while playing Scrabble with the cat. 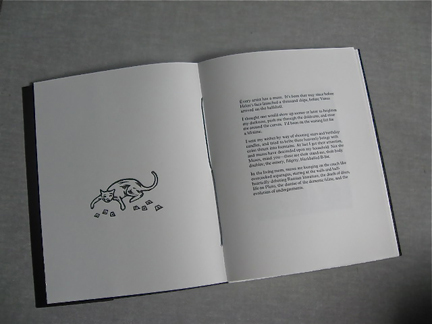 This is the first book I did entirely of wood engravings. I had the good fortune of landing in a class with the delightful and amazingly talented Gaylord Schanilec (to whom I will always be grateful for introducing me to this technique) and quickly became smitten with engraving. Living in Burnsville, NC at the time, I was no stranger to being holed up writing in the winter, and this book is the product of that cabin fever. 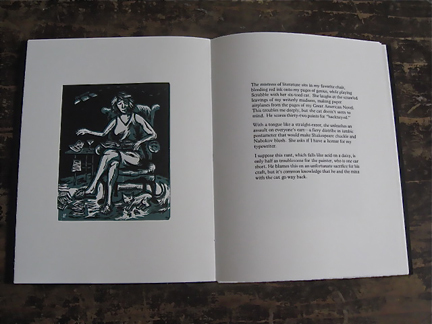 Printed on Zerkall paper using two-color wood engravings and hand-set metal type. 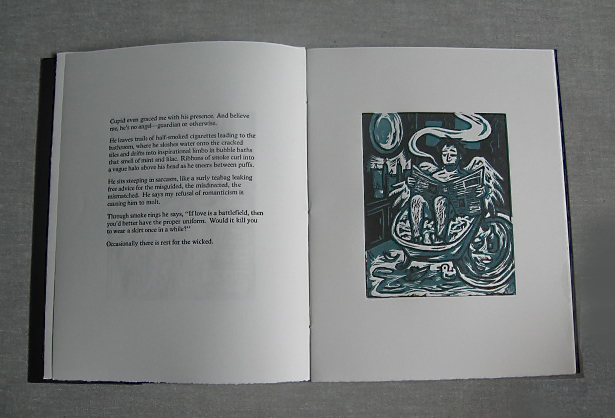 Edition of 23. 8″ x 9″. $150. Previous Article← What’s the Labor That You Love?